A EUAM planning team delegation led by Head of Outreach James Donally has met representatives of the Kharkiv law enforcement agency. It was the second visit within a month after a first contact had been established in mid-August. Both parties discussed on the current situation and tried to identify future cooperation opportunities in the field of the civilian security sector reforms. EUAM is a non-executive advisory mission sent to Ukraine on invitation of the Ukrainian authorities. 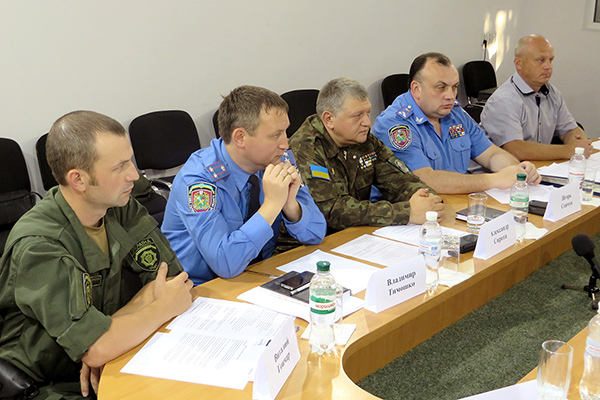 The mission supports and advises the security sector reform framework and focuses on achieving improvements in governance and effective management of efficient and fair law enforcement under democratic and legitimate control, so to establish public trust and accountability of all Rule of law actors towards the Ukrainian citizens. Although the mission has its headquarters in Kiev, it will cover the whole Ukrainian territory. The mission’s outreach team has so far visited counterparts in Lviv, Odessa and Kharkiv. Further visits are in planning. The latest Kharkiv meeting with Deputy Head of MoIA Police Department in Kharkiv oblast Igor Senchuk, the Advisor to the Head of Police Department Oleksandr Syrota, the Head of the Criminal Investigation Department Volodymyr Tymoshko, the Head expert of the Counter explosive Service Vitaliy Honchar and the Head of K9 Viacheslav Druchenko , was mainly dealing with Kharkiv Police’s work in the Eastern conflict, inter alia in criminal investigation, counter explosive and dog handling matters. Strategic information matters also were shortly addressed. Further meetings could be arranged in order to deepen the good relationship between the two partners and plan on future cooperation. EUAM, which has been established on the EU Council decision of 22 July 2014, will officially deploy by mid-September. For the time being a 19 people strong planning team is in Kyiv, working on the Mission’s setting up the mission’s structure and liaising with future counterparts in view of the arrival of all EUAM advisors.